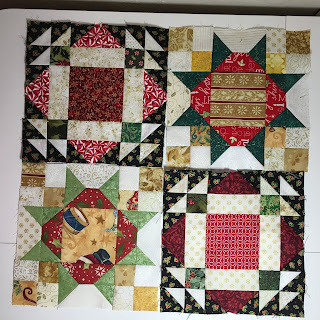 I hit the ground running when I got home last night and quickly made a few blocks of Clue #4 of the Allietare Mystery Quilt from Bonnie Hunter at Quiltville Quips and Snips. Have you been playing along with her mystery? I was doing so well keeping up and then Christmas hit and a trip to Arizona to see the grandkids for a week and now that makes me way behind! I got all of clue #4 cut out on Christmas Eve day and some sewing too. I took them to Arizona thinking I might get some more done. I did get a few finished but it was a long way from the 120 needed. This morning I played some catch-up. I now have them all cut, the pairs sewn, and pressed; just need to sew the pairs together to make the unit. I just couldn't stand it though, I had to sew a few pairs together to make the unit. Then Allietare Clue #5 came out a week ago last Friday, while I was on my way to Arizona. None of these units from Clue #5 were made until now. I made enough to assemble 2 blocks. Again, I just couldn't stand it. I needed to make 98 of these. Remember my gray is black and my black is green. Here are my 8 of the 98. And now Clue #6 the reveal came out last Friday, still while I was in Arizona. So here is Allietare Block Echos of Pisa Block A If you remember, 4 of the headless geese units needed for this block were made in Clue #2. You can read about it here. And the corner units from above were suppose to be made in Clue #5 (from above). And here is Allietare Star Block B. The 4 patch units were made in Clue #3. You can read about it here. The hour glass looking units were made in Clue #4. You can read about my Clue #4 here. I'm loving this! 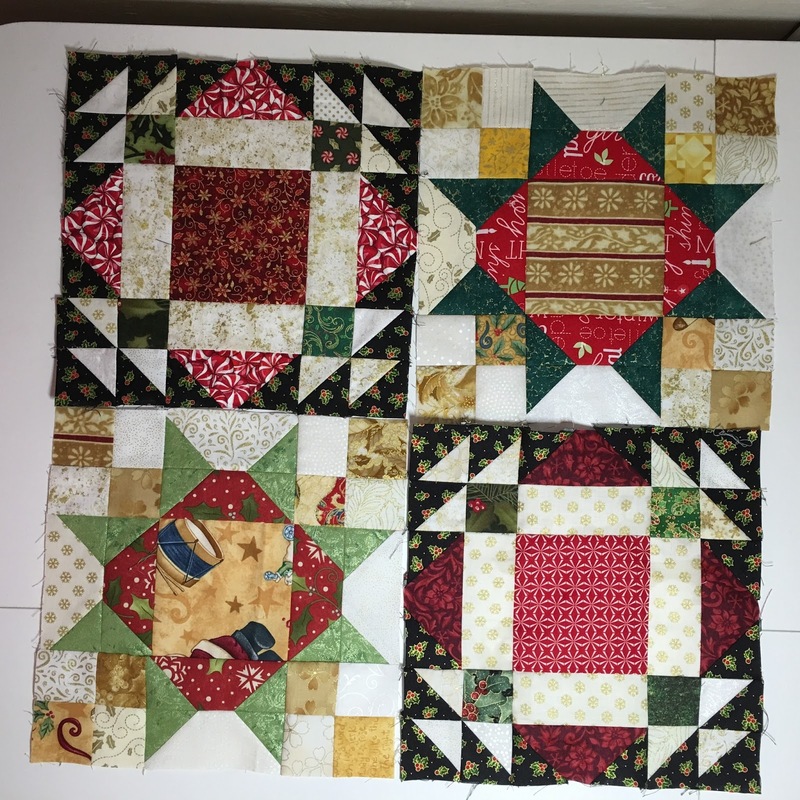 I can't wait to get all the blocks done and the pieced setting triangles made. However, I saving it for a retreat project next week. Be sure to come back then and see how it turned out. 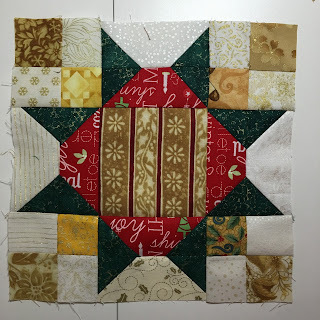 I'm also linking up on Quiltville's linky party page here. Be sure to go see all the other color combinations there are. Some used Bonnie's suggested colors and some went off on their own and got very creative. I love it when they do that. I have a ton of Christmas fabric and almost did my in that colorway. After seeing yours, I really want to make a throw in this pattern with Christmas fabrics! Your fabrics are great, the most beautiful Christmas blocks! Love this pattern.